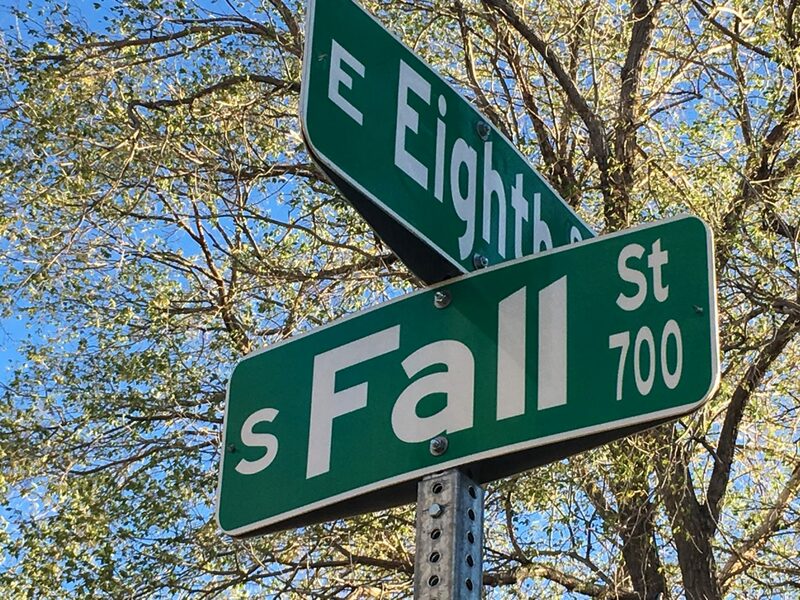 On walkies one morning, I noticed the light on the street sign at Eighth and Fall. The irony amused me. The Girl and I returned from our trip to Denver about a week ago. The weekend and first few days of the week were filled (for me) with work. A client needed help with a critical phase of her project and I was able to help her. I returned with a Winder$ box that needed some work (a failed hard drive for starters and additional upgrades) and spent a couple of days working through its issues before it was stabilized. But, even with being busy, part of every day is spent outdoors with the Girl. She needs outside time and interaction with me. I need outside time and interaction with her and our circle of doggie-friends. Even on cold mornings (and we’ve had a few already) we get out at least once and usually twice. With the shortening days it’s more difficult to get in two walks a day, but we’re managing. One cold morning I noticed the light on the street sign near the hotel where we stay. 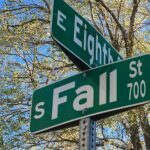 The irony of “fall” made me chuckle as I paused for a capture. The Girl, impatient as she can be in the morning (“gotta poo!”) pushed her energy at me (“let’s go… now!”) and so I made the hasty capture and off we went for morning walkies. I’m settling back into my routine after the odd days of travel. It looks like the Grand Junction engagement is not going to happen. I’m completely OK with that — if they don’t offer me the position then I don’t have to decide. That is my approach these days. I can make a living (I think and God willing) without a full-time gig. I’ll have less money. I’m OK with that. I’ll have more time. I’m OK with that too. So, whether or not a full-time (or part-time) gig materializes, I’m OK with it. God provides what I need and I have an abundance already. I do not need more. So, back here in Carson City I’m happy. I like it here. I like the climate. I like the outdoors. I like the mountains. I can go to the coast if I want to (and if I want to spend time in PRK). I’ll have time this winter to work on some projects I want done. In the spring we’ll spend more time outdoors as the days lengthen again into summer. I have more captures and more thoughts rattling around in my head. For the next few days, though, I’m going to spend some time reflecting on thankfulness. I do that as a kind of tradition. But it’s more than a tradition; it’s real. I am thankful. I also have a little work to do. Work is good, too. It’s good to be back in Nevada. This place feels like home to me.